In Western Colorado, we look up and our skies are blue. There are the occasional clouds, and smoke from fires… prescribed or not, but luckily, weather permitting, they are blue. 25 years ago Voyager I looked back and took a photo of our “pale blue dot” at Carl Sagan’s suggestion. 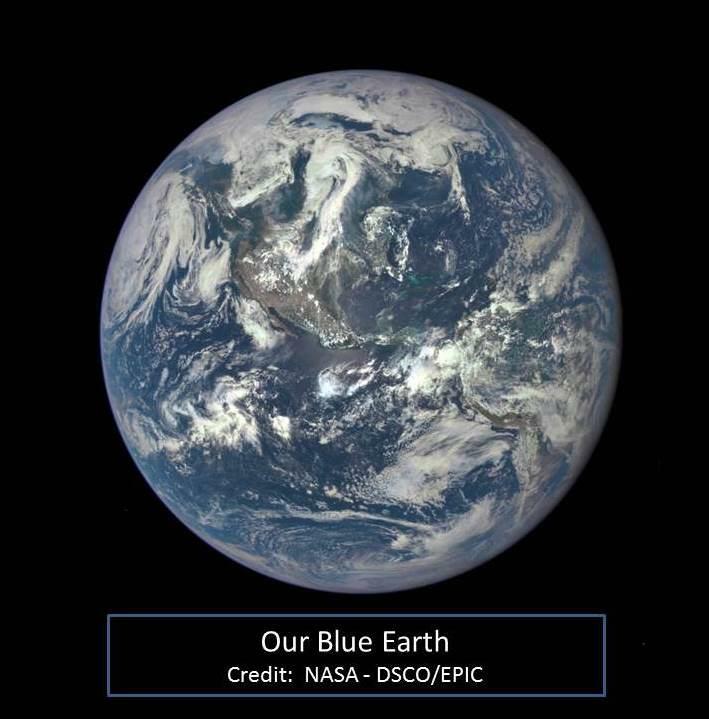 On the way to the Moon in 1972, the Apollo 17 astronauts imaged the Earth and called it “The Blue Marble.” And recently, the new Deep Space Climate Observatory Satellite looked down from orbit a million miles away and took an “EPIC” photo of our bluish planet, using their new Earth Polychromatic Imaging Camera. The light from the Sun looks white. But in reality, it is made up of all the colors of the rainbow: red, orange, yellow, green, blue, indigo, and violet. Light travels in a straight line unless something gets in the way to reflect it, bend it, or scatter it. As sunlight reaches Earth's atmosphere, it is separated into colors like light through a prism. Then it is scattered in all directions by the gases and particles in the air. Blue light is scattered by the tiny molecules of oxygen and nitrogen that are the major components of the atmosphere. Blue is scattered more than other colors because it travels as shorter waves. These shorter waves bounce around in the atmosphere, like particles in a snow globe filling the sky, then settling into our field of view. This is why we see a blue sky most of the time. Sunsets are redder because light passes through more atmosphere and the blue light is scattered out and away from the line of sight, allowing reds and yellows to pass straight through to your eyes. So now you know why the sky is blue.